It is by far the one question that people ask the most - "How do we transition to a world based on peace, unity and global cooperation to address humanity's problems?" Simple - We unite and work together as 'One People'. And the good news - This transition has already begun! 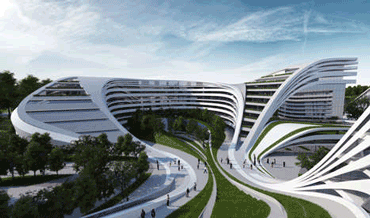 Globally, a transformation towards unity is also taking place. The internet has played a major role in this change. People now have instant access to news and global events. They are more informed and ideas are being shared more quickly. Our 'global consciousness' is waking up. When humanity unites as one people, it removes ALL LIMITS to its potential. There will be no more war, conflicts, poverty...etc. It will work together in cooperation to address every major problem in the world today. The ultimate role of the International Humanitarian Organisation is to remove the ‘conflicted state’ between National Governments. This allows humanity to work together in true unity and global cooperation enabling it to effectively address every major humanitarian challenge in the world today. After thousands of years, humanity has arrived at one of the most important transitions in its history. Your role in this transition is vitally important. It is you who will decide humanity's future. Historically, many countries previously transitioned to a 'national system' or government to address 'local' conflicts, divisions, self-interest...between regions/dynasties/competing groups, etc. Some form of 'national unity' or government was necessary to end the 'local divisions and conflicting interests'. As human society has become more globalised, conflicting interests between National Governments have become an inevitable problem. So a transition towards 'global unity and cooperation' is now also required to address those divisions and conflicts of interest. However, this transition needs a humanitarian approach - not a political one. As a state of 'competitive self-interest' exists, people and politicians will resort to aggressive, illegal and other forms of negative behaviour in an attempt 'to win' - to beat their competition. They can be egotistical, arrogant, deceitful, manipulative, and even violent in their ambition to maintain profits, power, status, etc. This attitude will result in many poor decisions, all of which have a negative impact on the world. This Infographic highlights the 'TRANSITION PATH' and obvious benefits of a global collaboration between humanitarian focused individuals, groups and organisations around the world. It highlights how they can ALL SUCCESSFULLY ACHIEVE THEIR GOALS by simply 'working together'. A BETTER WORLD for ALL! When you establish a foundation of unity, cooperation and 'common interest', people will make wiser decisions. Great ideas are not restricted by 'cost'. We base our decisions on the benefit that they offer to society. And with the focus now being global - not national - our approach becomes 'How can we build a better world together so that we ALL BENEFIT'? This unified approach encourages everyone to engage 'positively' as we all benefit from the great ideas that we implement. This encourages everyone to look for the 'wisest' possible solution/s for any given problem - which results in significant improvements in every sector of society. The 'International Humanitarian Organisation' (IHO) is a collaboration of humanitarian individuals, groups and organisations from around the world. While so many truly want to help make a significant and positive difference in the world, a great majority recognise that the task is too great to achieve alone. We simply do not have the numbers, resources or necessary authority to implement the appropriate changes. Considered honestly and objectively, our best possible chance of SUCCESS is to UNITE and WORK TOGETHER! Unite our goals, strengths, numbers, resources and determination to address the urgent problems that our world faces - and TOGETHER we can and will SUCCEED. This is YOUR Organisation. It is for the People of the World. Each member of the Organisation will have the ability to collaborate with others, and by working together in cooperation, create a better world for all. A 'Directive' simply refers to a priority or goal. The IHO will have two sets of directives. 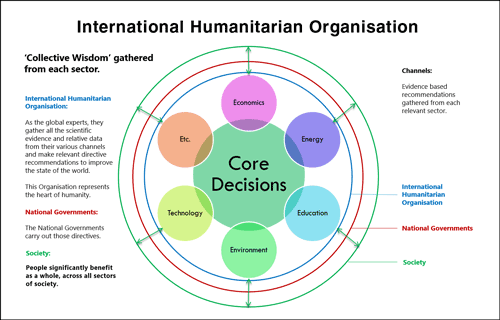 The core directives are the 'humanitarian goals' of the organisation. They are effectively the same common-sense goals shared by humanitarian individuals, groups and organisations around the world. This inclusive approach provides the basis for allowing all groups to unite and work together. Here is a simple example of a 'core directive' as it may appear on the IHO Website. While the core directives provide the focus, the collaboration directives will provide the means to achieve them. These directives will be decided by the IHO members. Through their global network of knowledge, tools and resources, they will coordinate and work together to come up with appropriate solutions which take advantage of their unity and collaborative spirit. 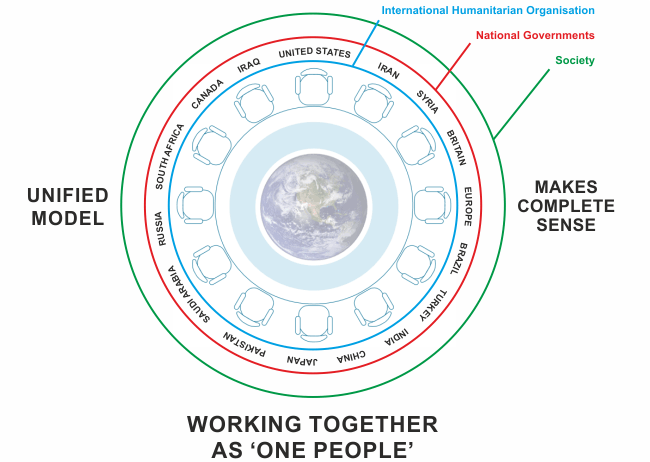 As more and more humanitarian individuals, groups and organisations 'decide' to unite and work together for a better world, they create the necessary psychological and practical shift to help 'transition humanity' towards a NEW Model which will bring about peace and real change to the world. The following Groups have already made this commitment. They will form the official membership of the 'International Humanitarian Organisation' along with individuals around the world. While 'principles' provide the general basis for an Organisation's framework, it is essential that we live up to these principles by putting in place appropriate standards. For example, it is no good talking about collaboration and cooperation to create a better world if people insist on wanting to compete AGAINST each other. This is the system we have now - and it doesn't work! A set of standards should be put in place by the IHO Members. This will need to be done once the membership program begins. The combination of an 'openly transparent approach' based on humanitarian 'principles' that are supported by relevant 'standards', equates to a system of 'integrity' that will ensure confidence and support. For example, the IHO will always be 'openly transparent'. A set of standards will need to be put in place to ensure that the organisation operates transparently across all important areas - like key decisions and funding. Once those standards are in place, this will ensure there is solid integrity in place.